My friend Lauren talked me into doing the Zombie Run a couple months ago with her and her husband. Neither of them are runners, so I went into it knowing that we would probably be walking a lot. It was held at Shelby Bottoms with a 4pm starting time to allow the zombies to have their transformations into the undead completed. We were running as humans, as the zombies in this race don’t actually run, but just stand around waiting for runners to come by. We arrived and went through check-in smoothly. I decided to put on the race tee, so I switched out shirts. There was no bag check, but they had given us all backpacks, so all my stuff got put in there. Note to self: I hate running with a backpack. The start was a little late, but soon we were off. One thing they did really well was the whole cinematic effect. During the first half mile or so, you run by set-ups of people in lab coats screaming to turn around and go back, that there’s been an infestation! Then you pass by some more people in lab coats lying on the ground, dead. Finally, you reach the zombies. In this race, each person has three life ribbons hanging off a belt. Once your life ribbons were gone, then I guess you are dead, though you get to keep running. Zombies were positioned across the trail, about three per spot and attempt to grab your ribbons. The ribbons on each side of me got taken pretty quickly, but the one in back eluded the zombies for a while. After a water stop, we began mile two. 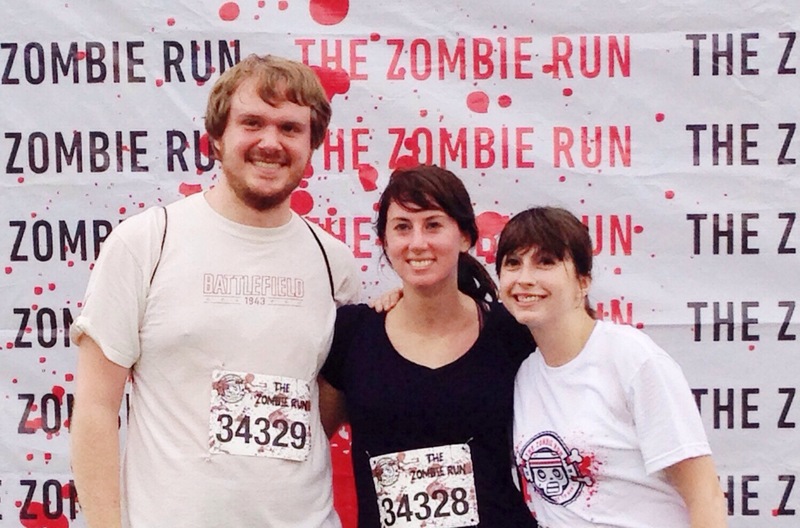 My strategy was to casually jog up to the zombies, as if I were out of ribbons, and then sprint past them. This is exactly what I did when a zombie came out of nowhere and got my last ribbon! So with only one mile down and two to go, all three of us were the running dead. The theming was the best part of the race. The water stations were labeled as “vaccination stations” and there were setups like a school bus full of zombies that we ran by. I walked with Lauren and Chris most of the way, pushing them to run the downhills at least. With a half mile to go, I took off and left them. Sorry guys! Although that was mostly spent dodging all the other people that were walking and taking up the whole trail walking side-by-side. Overall it was pretty fun, but I think there were way too many zombies on the course. It would be better if they were more spread out too, instead of clustered in groups. It was pretty impossible to make it all the way through with your life ribbons without cheating and getting more or hiding them in your pockets.